A canopy provides shade and privacy when used outdoors as well as a touch of romance when used in the bedroom. 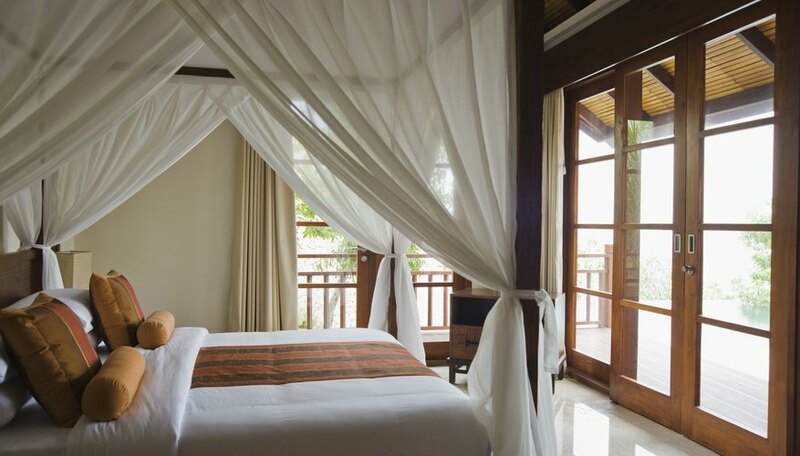 Combine the two and create an outdoor canopy bed retreat to read, sunbathe and relax together with your sweetheart. You can find canopies in different colors, designs, textures and styles. A canopy turns your bedroom into a romantic oasis. You don't need to have a canopy-style bed to enjoy the romantic look of a canopy. Install curtain rods to the ceiling, select your curtains and install over the bed. You can find canopy curtain rods and curtains in a variety of textures, colors, sizes and designs. Search major retailers as well as online retailers for ones that suits your tastes. Choose from silk, satin, velvet, sheer lace or black-out curtains for the ultimate experience in seclusion. Transform your backyard pergola into a romantic outdoor oasis, such as those found at Caribbean resorts. Add a flowing, semi-transparent white canopy to provide comfortable shade as well as some privacy. Replace lawn furniture with a soft gazebo loveseat or lounge chair. Add other furnishings and decorative accents such as a coffee table, ice chest, pillows or install surround sound speakers and mood lighting to enjoy your outdoor retreat at night as well. Enjoy the comforts of a comfortable bed while lounging by the pool in an outdoor canopy bed. Choose from a lavish all-in-one canopy bed designs or purchase an outdoor bed and build a custom canopy. Many outdoor beds come with a built-in canopy. Draw back the canopy and soak up the sun, take a nap or relax with your sweetheart. Then, draw the canopy close for a little bit of solitude. Add comfortable pillows and a throw blanket and watch the stars put on a show. Whether hosting a party indoors or out, a canopy adds a soft, dreamy touch. Use a canopy to soften the lighting, provide protection from the sunor to transform a marriage altar to a festive arch of flowing fabrics, flowers or balloons. Add decorative accents such as tulle, or hang crystals, a chandelier or strings of light to keep the party going. Diranian, Susan. "Romantic Canopy Ideas." Dating Tips - Match.com, https://datingtips.match.com/romantic-canopy-ideas-8309369.html. Accessed 19 April 2019.